Most in the Jersey Pools offer both open lanes for independent swimming and also guided activities like water aerobics or Aquabike. Do you know of any Pools in Jersey that should be listed here? Contact us!. There are typically discounts available to senior citizens and small children for independent swim. 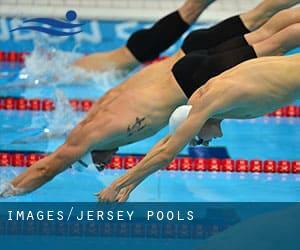 Find out by contacting your nearest pool among these Jersey Pools. Traveling to Jersey? This is the right spot on the internet to find places to swim in Jersey. Each day you're not swimming you happen to be losing precious time in improving your abilities to be a greater swimmer! No more excuses! Get your nearest Jersey Swimming Pool and tell us how it went. Thanks to some new pools submitted by swimmers like you, Swimia.com is increasing in the daily quantity of stored pools. 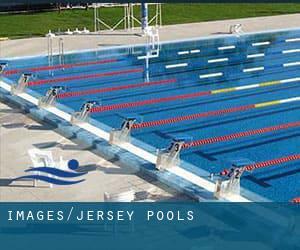 Please don't hesitate to contact us if you locate any Jersey Swimming Pool with inaccurate or incomplete information. Please use the make contact with data provided at each pool profile to check if they are offering aquagym lessons, because isn't so common to see an Aquagym in Jersey. There are several reasons why you should choose a heated swimming pool in Jersey. Essentially the most critical one relies on the importance of keeping the body temperature stable. If the water is too cold, your body will try to warm it up and you will shed strength to swim appropriately. Enjoy the best indoor pools in Jersey and don't worry about the weather. These facilities are open all seasons and you can enjoy a swim at the same temperature every day of the year. Whereas Saint Helier is one of the six most populous cities in Jersey with almost 28.000 residents, you shouldn't miss that one if you're going to Jersey. Don Farm , La Route des Quennevais , Saint Brelade , Channel Islands , UNITED KINGDOM (Postal Code: JE3 8LZ). Swimmers like you reported 25 meters, 8 lanes, Indoors. Unfortunately we do not have the email address of this Swimming Pool, but we can give you the phone number. The Waterfront , La rue de l’Etau , Saint Helier , Channel Islands , UNITED KINGDOM (Postal Code: Unknown). Among all of the activities provided by the center, in case you are enthusiastic about swimming you will enjoy 25 meters, 6 lanes, Indoors. Just in case you would like to contact this Swimming Pool before dropping by, we only know the phone number. La Grande Route Du Mont a L´Abbe , Saint Helier , Channel Islands , UNITED KINGDOM (Postal Code: JE2 3HA). Among all the activities provided by the center, if you are thinking about swimming you will delight in 25 meters, 6 lanes, Indoors. Just in case you want to make contact with this Swimming Pool before dropping by, we only know the phone number. Jersey College for Girls , Le Mont Millais , Saint Saviour , Channel Islands , UNITED KINGDOM (Postal Code: JE2 7YB). Among all the activities offered by the center, should you be considering swimming you will enjoy 25 meters, 5 lanes, 1 meters - 2 meters depth, 1 meters - 2 meters depth, Indoors. Just in case you need to contact this Swimming Pool just before dropping by, we only know the phone number.